Mr Tibbits’s Catholic School. By Ysenda Maxtone Graham. Introduction by A.N. Wilson. Afterword by Julian Fellowes. Illustrations by Kath Walker. Slightly Foxed, 199 pp., £15, paperback. A nun once stuffed young Bruce Springsteen into a garbage can because, a biographer reports, “that’s where you belong.” Such incidents abound in books about American Catholic education in the middle decades of the 20th century and tend to turn them into horror stories or bleak comedies of errors that wrest humor from pain. No one would have been likely to ask that question about Tibbits, who resembled “a Beatrix Potter drawing of a very nice old pig” and was known for “extreme strictness” mixed with “the deepest kindness, compassion and care for the forming of boys’ minds and souls.” Nor would anyone have asked it about his wife, who chain-smoked Benson & Hedges as she presided over the ground-floor corridor in a nylon housecoat. The Tibbitses attracted teachers with similar quirks. A retired Cockney customs officer, flush with his wife’s money, taught math and boasted, “I could buy the whole lot of you out.” A beautiful Polish princess arrived as a maternity-leave replacement for one of the few women on hand and fell in love with the geography instructor. John Tregear, the French teacher, “wore black boots with red cork high heels and drainpipe trousers.” He leaps to immortality in one of the witty line drawings by Kath Walker that add as much charm to this book as Arthur Watts’s do to E.M. Delafield’s Diary of a Provincial Lady. For all of this, St Philip’s had high educational and spiritual standards that boys strived to uphold. One former student told Maxtone Graham that at the age of seven he was reading Treasure Island: “You were expected to be good at drawing, good at reading, interested in foreign lands.” The high-achieving the families associated with the school suggest that students met those standards: Downton Abbey creator Julian Fellowes attended St Philip’s, the biographer Antonia Fraser sent her son, Orlando, there, and the composer Andrew Lloyd Webber’s mother taught singing. Maxtone Graham has rewarded the trust of those who spoke with her by writing a history distinguished by the perfection of its tone: She writes in the first person, so that her story reads like a memoir, but keeps her focus on St Philip’s. In its casual tone, her book resembles many English schoolboy stories less than Diana Athill’s recent memoirs, including Somewhere Towards the End. Mr Tibbit’s Catholic School might have been called Somewhere Towards the End of the Reign of Richard Tibbits. Worst line: None. But a few more details on some would have been welcome. The book notes, for example, that Antonia Fraser was a school mother but not whether she sent all her sons there or just one. Learn more about the book on the publisher’s website. Mr Tibbits’s Catholic School is available from Crawford Doyle Booksellers in New York. Allison Pearson wrote about the book in the Telegraph. About the author: Ysenda Maxtone Graham also wrote The Real Mrs. Miniver, a finalist for the Whitbread biography prize. Janice Harayda is a novelist and award-winning journalist who has been the book columnist for Glamour, the book critic for the Plain Dealer in Cleveland, and a vice-president of the National Book Critics Circle. You can follow Jan (@janiceharayda) on Twitter by clicking on the “Follow” button at right. 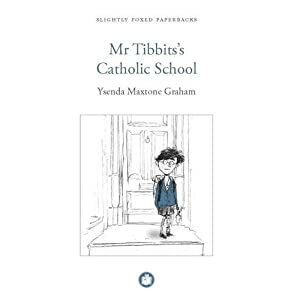 What I’m reading: Mr Tibbits’s Catholic School (Slightly Foxed, 199 pp., £11), by Ysenda Maxtone Graham. Introduction by A.N. Wilson. Afterword by Julian Fellowes. What it is: A history of St Philip’s school in London and its idiosyncratic founding headmaster, Richard Tibbits. Read A.N. Wilson’s introduction to Mr Tibbits’s Catholic School. To learn more about the book or buy a copy, visit the site for Foxed Quartely. Mr Tibbits’s Catholic School is also available from Crawford Doyle Booksellers in New York. About the author: Ysenda Maxtone Graham also wrote The Real Mrs Miniver, a finalist for the Whitbread biography prize. Collected Stories: Revised Edition. By Donald Margulies. Dramatists Play Service, 68 pp., $8.95, paper. Who owns the story of an adult’s life? Donald Margulies explores the moral and psychological implications of the question in Collected Stories, which had a brief run on Broadway earlier this year. Margulies doesn’t parse legal issues in this play about a 55-year-old New York writing teacher, Ruth Steiner, and her evolving relationship with a young student, Lisa Morrison, who forges her own career. Who is right? The play leans toward Ruth but has little new to say about the age-old dance of transference and countertransference between a mentor and protégée. As in his Pulitzer Prize–winning Dinner With Friends, Margulies paints his characters’ needs with a broad brush. But he’s a skilled craftsman: He seems to have removed every needless word with the literary equivalent of turpentine, and his play is well-paced and structured. And the question “Who owns the story of your life?” has gained provocative and slippery dimensions in the age of Facebook and text messages. High school and college students might have hours of lively arguments about this play even as their elders prefer to dust-off their Vintage paperback editions of Poets in Their Youth. You may also want to read: Jonathan Yardley’s review of Poets in Their Youth: A Memoir (Vintage, 1983), Eileen Simpson’s memoir of her husband, John Berryman, and his circle, including Delmore Schwartz. Read a review of the 2010 Broadway production of Collected Stories in the Wall Street Journal. You can order Collected Stories online though Dramatists Play Service. A review of Going Rogue appeared last week. You can also follow Jan Harayda on Twitter www.twitter.com/janiceharayda. The Dunderheads. By Paul Fleischman. Illustrated by David Roberts. Candlewick, 56 pp., $16.99. Age range: See discussion below. A cynic might call The Dunderheads an ideal book for anyone who believes that children are never too young to learn that some women with large breasts do have small brains. But that view may be too harsh. David Roberts’s pictures are often funny even if the protagonist of this book looks like a refugee from a wacky Hooters franchise staffed by middle-aged teachers-union members. The cruel Miss Breakbone seems not to have gotten the message that she might crush her students’ fragile self-esteem if she never assigns essays on topics like, “Why I’m Special.” She brazenly calls her class a bunch of dunderheads – at least when she isn’t confiscating their cell phones and vowing not to give them back. All of this is reasonably diverting, owing largely to Roberts’s flair for visually amusing details, such as the skull-shaped lamp on Miss Breakbone’s dresser. But the plotting isn’t as clever nor is the writing as sharp as in in many other tales of a classroom revolt, such as Miss Nelson Is Missing!. Miss Breakbone’s name, for example, is somewhat labored and not as funny as that of Viola Swamp in Harry Allard and James Marshall’s back-to-school tale. And a goggle-eyed character named “Google-Eyes” may leave some children using the incorrect phrase for a lifetime. Best line / picture: Roberts’s spread showing the movie addict named Hollywood in a bunker-like room full of cables, DVDs, Oscar statues, and a television and larger-than-life remote control. Worst line / picture: “That’s when Google-Eyes went to work.” The girl shown on this spread isn’t “Google-eyed” but “goggle-eyed.” Fleischman also writes: “Spider went up the drainpipe like malt up a straw.” That similie sounds dated coming from a young narrator whose classmates bring cell phones to school, all members of a generation that might never drink a malted milk (if that’s what’s meant here). Suggested age range: The publisher recommends this book for ages 6–10. 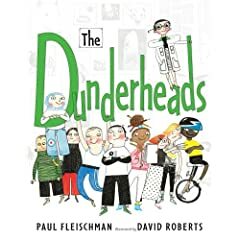 This suggestion is unrealistic for many children given that The Dunderheads has a picture-book format and children often begin to spurn picture books at about the age of 6 or 7 (and to crave picture books that have more than 32 pages, as this one does, one starting at 4 or 5). School Library Journal says the book is for Grades 2-5 (roughly ages 7-10). But, again, it seems too optimistic to believe this book would appeal to many 8- and 9-year-olds who have enjoyed, for example, The Invention of Hugo Cabret. The natural audience for the format of The Dunderheads might seem to be 4- and 5-year-olds who want picture books with more than the usual 32 pages, such as the original Flat Stanley with words by Jeff Brown and illustrations by Tomi Ungerer. But — speaking just for myself — I wouldn’t give this one to a literal-minded child who start school soon because of its message, however humorously developed, that some teachers just hate children and, if you get one, you may feel better if you take criminal acts of revenge. About the author and illustrator: Fleischman, a Californian, won the 1989 Newbery Medal for Joyful Noise: Poems for Two Voices and has posted an excerpt from it on his Web site. Roberts lives in London and has illustrated many books for children, some of them prize-winners. Reviews of books for children or teenagers appear every Saturday on One-Minute Book Reviews. To avoid missing these reviews, please bookmark this site or subscribe to the RSS feed. Books that will reviewed on this site are sometimes announced in advance at www.twitter.com/janiceharayda. Many of the helpful Brits work for the tourist boards Visit Britain www.visitbritain.com, Visit Scotland www.visitscotland.com and Visit Wales www.visitwales.com. And some of them came up with a great interactive online map of England that lets children learn about places linked to characters in books like Black Beauty, Alice’s Adventures in Wonderland and the Harry Potter series. I learned about this delightful storybook map from Ceri Radford, who wrote in her blog about books in the Telegraph: “You can browse by book title, then click to find out more about the work and its location. Kudos to Enjoy England, the marketing arm of Visit Britain, for coming up with the idea.” You can read more about it here blogs.telegraph.co.uk/arts/ceriradford/dec07/. Relentless meanness isn’t new in children’s books. What is new that it’s showing up in books aimed at younger and younger ages. On Saturday One-Minute Book Reviews will review a picture book for preschoolers that exemplifies the trend with a mean-spirited heroine who feels no remorse for her misbehavior. Jack Plank Tells Tales. Story and pictures by Natalie Babbitt. Scholastic/Michael Di Capua, 128 pp., $15.95. Ages 7–9 (ages 4 and up for reading aloud). 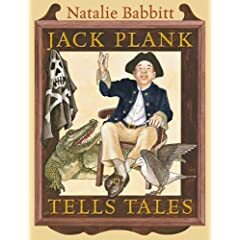 Jack Plank Tells Tales is the book many parents have been waiting for – a pirate story for children too old for picture books but too young for Treasure Island. It lacks the psychological heft and stylistic perfection of Natalie Babbitt’s Tuck Everlasting, a modern classic. But it’s several nautical miles beyond many other recent pirate stories, including Peter Pan rip-offs and cheesy movie tie-ins. Jack Plank is an amiable out-of-work pirate who is cast off the ship Avarice because he lacks a talent for plunder: “You have to yell and make faces and rattle your sword, and once you’ve got people scared, you take things away from them.” So he has to find a new job after he settles into a boarding house on Jamaica in about 1720. Each day he looks for work, with the proprietor’s 11-year-old daughter as his guide, and finds something wrong with one of his options. He can’t fish because it reminds him of a shipmate’s story of a man who turned into an octopus and can’t work in a sugarcane field because he would have to cross a bridge that brings to mind a sailor’s account of a troll. Each night he entertains the boardinghouse residents with another tale of why he has come up empty-handed, which leads soon to a job that suits him the way a deep harbor suits a galleon. The stop-and-go narrative makes this book good bedtime reading for children who can handle its two deaths by stabbing even as the lack of a strong forward momentum may make it easier for others to put down. And there’s not much thematic development – this is light entertainment, an amusing cycle of stories billed by the publisher as a novel. But Babbitt’s engaging pencil drawings – and a handsome jacket and design by Kathleen Westray – help to offset the narrative limits. The refusal of American Library Association www.ala.org to give Tuck Everlasting a Newbery Medal or Honor Book citation may have been the organization’s greatest awards blunder of the past 40 years, compounded by its continual failure to recognize Babbitt with the Margaret A. Edwards award for lifetime achievement. Lois Lowry is a good writer. But why Lowry has won the Edwards award and Babbitt hasn’t is a mystery that this appealing book only deepens. Best line: Many of the tales in this book develop folkloric motifs such as that of the mummy’s hand, and its story of a girl raised by seagulls has an especially memorable illustration of a feral child. Worst line: The last: “But it seems to be sure that, as Waddy Spoonton pointed out, it’s never too late to be happy.” This ending is unusually sugary – and clichéd – for Babbitt. And the text doesn’t really prepare you for it. Furthermore: Babbitt won a Newbery Honor Book designation for Kneeknock Rise, a completely inadequate recognition of her body of work from the ALA. As a former vice-president for awards of the National Book Critics Circle, I appreciate the great difficulty of getting literary prizes right. But the ALA is just embarrassing itself on this one.